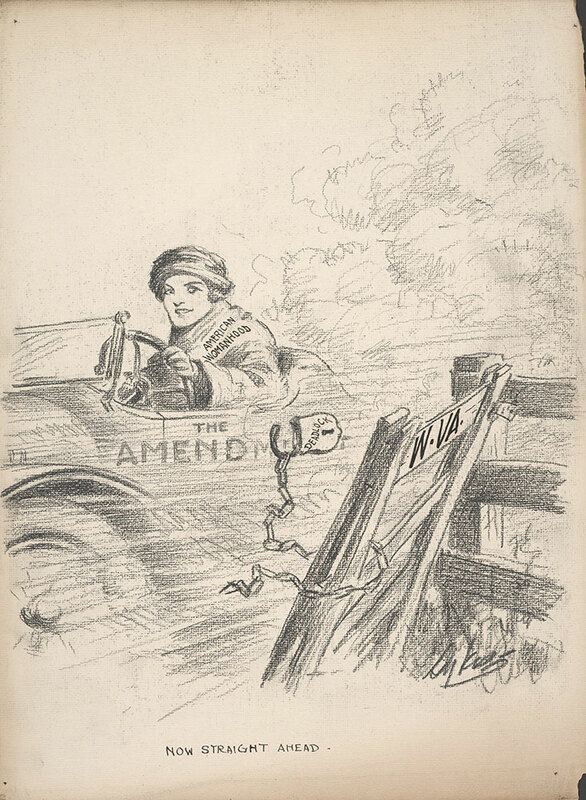 Notes: "After the war, the Nineteenth Amendment to the U.S. Constitution was proposed, giving the vote to women. The Constitution requires three-fourths of all states to approve a constitutional amendment before it becomes a law. In February 1920, the West Virginia Legislature met in special session and were lobbied heavily by the state's suffragists, led by Lenna Lowe Yost. On March 3, the House voted for the amendment. In a fifteen to fourteen vote on March 10, the state Senate made West Virginia the thirty-fourth of the thirty-six states needed to ratify the amendment." ___ West Virginia Division of Culture and History. (2014). "West Virginia's Suffrage Movement." West Virginia Archives and History. Retrieved from: http://www.wvculture.org/index.aspx. Bibliography: Sykes, Charles Henry. "Now Straight Ahead." Evening Public Ledger (Philadelphia, PA). 1920, March 12: p. 10.